Research Like a Pro, Part 4: What’s the Plan? Have you ever sat down at your computer to do some genealogy research and two hours later you come up for air? You’ve found interesting documents and looked at a lot of websites, but you didn’t find what you wanted and you don’t know where you looked? If so, you are not alone! Disciplining yourself to create a simple research plan and follow through is the hallmark of the true professional. Research Like a Pro, Part 1: What’s Your Question? Assignment: Analyze your pedigree, choose a research question, formulate an objective and write it down. Assignment: Revisit your research pertaining to your objective. Make a timeline of the sources you’ve already found. Analyze the evidence those sources hold. Keep track of the questions that come up along the way. Research Like a Pro, Part 3: Where Did They Live? Assignment: Research the location from your research objective and learn all that you can about the geography, migration into the area, jurisdictions, boundary changes, and the local history. 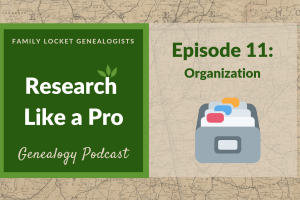 If you’d like to read about the whole process all at once, check out my book, Research Like a Pro: A Genealogist’s Guide. 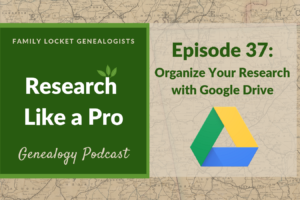 Now that you’ve chosen a research objective, analyzed the sources that you’ve already found, and done some research on the location where your ancestor lived, it’s time to make your research plan. You’ll want to come up with some specific strategies and sources to search that might answer your research question. Three steps will help you in this task. Cynthia Dillard was born about 1815 according to her reported age on the 1850, 1860, 1870, and 1880 census records. Cynthia Dillard was born in Georgia, Alabama, or Florida, according to the census records and her descendants as listed on their death certificates. Cynthia married Thomas Beverly Royston about 1833 in Georgia or Alabama, no marriage record has yet been located. Thomas Beverly Royston was listed in the 1831 tax list of Morgan County, Georgia. Thomas and Cynthia Royston owned land in DeKalb County, Alabama from 1837 – 1842 and are listed on the 1840 census in that county. Thomas and Cynthia Royston owned land and resided in Chambers County, Alabama from about 1842-1872 and are listed on the 1850, 1860, and 1870 census (Cynthia as a widow in 1870). Thomas Beverly Royston died in 1868 in Chambers County, Alabama and his estate file gives the information that Cynthia and some of the children “removed to Texas” about 1872. Cynthia Royston and some children are listed on the 1880 census of Collin County, Texas. Birthplace of her parents is given as Virginia. The estate file of Thomas Beverly Royston gives Cynthia’s date of death in Collin County, Texas as 2 August 1882. Once the facts are listed, you can form an educated guess about what might have happened. From the record I’ve assembled of Cynthia Dillard, I’ve formed this hypothesis. Cynthia Dillard’s father was probably born in Virginia about 1795 or earlier. He moved to Georgia by 1815 where Cynthia was born. He was living in the vicinity of Morgan County, Georgia by 1833 when Cynthia married Thomas Beverly Royston. He possibly died in Georgia or in Alabama if he also migrated to Alabama like Cynthia and Thomas Royston. You’ll notice that I chose Georgia as Cynthia’s birthplace, simply because that was the most likely. The census records all give Georgia as her birthplace, the reporting probably done by her husband or herself. I estimated her birth year from the census record’s reporting of her age and her father’s birthplace from the 1880 census information. I surmised that she was living somewhere near Morgan County, Georgia when she married since that was where her husband was taxed in 1831. You’ll notice that I have detailed specific dates and places. Marriage records for Thomas Beverly Royston and Cynthia should be rechecked for the years 1830-1835 in Georgia. As new records are added to online collections, the possibility of discovering the marriage record, if extant, increases. –Georgia Marriages, 1699-1944 Ancestry Index, source Hunting For Bears, comp. Georgia Marriages. Includes Morgan County and surrounding counties: Greene, Oconee (Clarke parent county), Walton, Newton, Jasper, and Putnam. -“Georgia Church Marriages, 1754-1960,” Family Search. –Morgan County, Georgia, “Marriages 1821-1854,” FHL film 158906, digitized and indexed on FamilySearch. -The 1830 Federal census should be searched for possible Dillard men, age 35 and older in Georgia. Cynthia would be noted as a tick mark, female age 15-20, possibly living in the household. Probate records for likely Dillard men, discovered by the census research should be examined for any mention of Cynthia. –Alabama, Wills and Probate Records, 1753-1999 Ancestry collection: images of probate records from the state of Alabama. 99% of Alabama counties included. -Georgia, Wills and Probate Records, 1742-1992: Ancestry collection: The collection includes more than 80% of Georgia counties. Some localities and time periods may not be included, browsing by county will show coverage and specifics of the records. Court Records should be searched from counties where Thomas and Cynthia Dillard Royston resided as well as the locations where identified possible Dillard fathers resided. Land Records of Alabama and Georgia could be searched for Dillard connections in the counties or neighboring counties where Thomas and Cynthia Royston lived. -Search the United States Bureau of Land Management Tract Books, 1800-c. 1955 FamilySearch collection, browse only; organized by state, then volume; the books are organized by township number and range number. -Search in the individual county any Dillard land obtained from a Federal Land Patent. Georgia’s land was distributed by the state through headright and bounty lands as well as a series of land lotteries. –Headright and Bounty Land Records, 1783-1909 are browseable by surname on FamilySearch; images of index cards and documents in the file. -Search in the individual county land records for any Dillard located in the Georgia Land records. As you can see, this is a detailed plan. I’m starting with what I know – the marriage of Thomas and Cynthia. 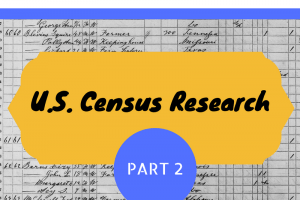 Next I’ll move on to the census records. Based on what I discover there, I’ll move forward with probate, court, and land records. You’ll notice that I include the links to the collections in my plan. The more you work on research planning the more efficient you’ll become. I spend about fifteen minutes on my plan and then I’m ready to go. I have a focus for my research session and at the end I know exactly what I’ve done. Your assignment? Create a working research plan following the four steps above. Use the objective you formulated at the beginning of this series and all that you’ve learned from your source analysis and locality research to choose the best sources to answer your research question. Learn more about the Research Like a Pro eCourse and Study Group here.